The medulloblastoma has been defined by the World Health Organization (WHO) as a "malignant, invasive embryonal tumor of the cerebellum with preferential manifestation in children, predominantly neuronal differentiation, and inherent tendency to metastasize via CSF [cerebrospinal fluid] pathways." Several subtypes of medulloblastoma have been recognized including: (1) desmoplastic/nodular type, (2) medulloblastoma with extensive nodularity, (3) large-cell variant, and (4) anaplastic medulloblastoma. Medulloblastoma is the most common malignant CNS tumor of childhood with an annual incidence of about 0.5-0.8/100,000 in children younger than 19 years. The vast majority of medulloblastomas occur before age 16 years, and there is a bimodal peak of incidence between ages 3-4 years and 8-9 years. About 10% of cases arise in infants. Males are affected more frequently than females with a ratio of about 2:1. Dissemination of medulloblastoma within CSF pathways is a defining pathobiologic characteristic of this tumor, and about 30% of patients will have CSF metastasis at presentation. Adult cases are unusual, accounting for less than 1% of brain tumors. The tumor is rare beyond the fifth decade. Symptoms and signs of an expanding posterior fossa mass may include nausea and vomiting, headaches, and ataxia. [3, 4] Hydrocephalus and increased intracranial pressure may result in papilledema. The development of cerebellar tonsillar herniation may be accompanied by neck pain. Meningeal irritation due to spread of tumor in the subarachnoid space may lead to neck stiffness and head tilt. Spinal metastases may result in focal findings at a spinal cord level or nerve root pain. Infants with medulloblastoma may present with failure to thrive, vomiting, and irritability. Medulloblastomas appear as hyperdense, noncalcified lesions of the fourth ventricle or cerebellar hemisphere on computed tomography (CT) scans. Magnetic resonance imaging (MRI) typically reveals a solid fourth ventricular mass that is hypointense on the T1-weighted image, hyperintense on T2-weighted images, and brightly enhancing on T1-weighted images after contrast administration (see the images below). Axial T2 magnetic resonance image showing a cerebellar vermian midline mass with contrast enhancement and obstruction of the 4th ventricle. 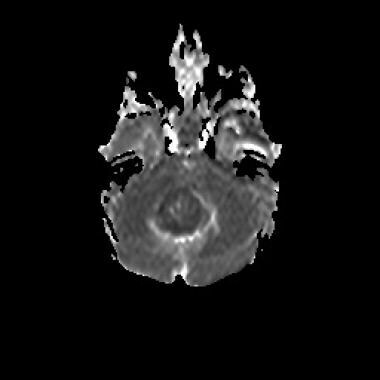 Coronal T1 magnetic resonance image showing a cerebellar vermian midline mass with contrast enhancement and obstruction of the 4th ventricle. Cerebellar hemispheric tumors of older children and adults show similar imaging features, except that contrast enhancement is more variable than in young children. 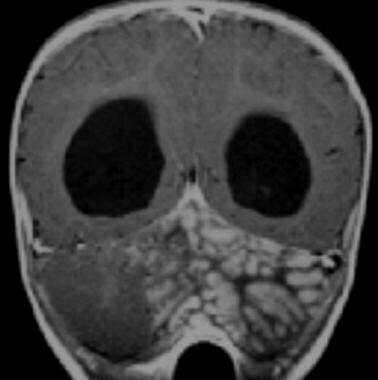 The "medulloblastoma with extensive nodularity" is a subtype that occurs in young children and has a distinctly lobular appearance on imaging, as shown in the following image. 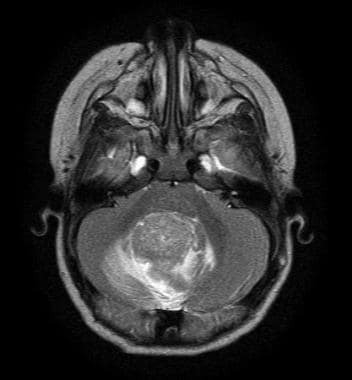 Magnetic resonance image showing a lateral cerebellar mass with a "grapelike" lobular appearance characteristic of the extensively nodular medulloblastoma. They typically show restriction diffusion on apparent diffusion coefficient (ADC) maps that are consistent with high cellularity (see the image below). Apparent diffusion coefficient (ADC) map of a histologically confirmed medulloblastoma showing restricted diffusion consistent with a tumor of high cellularity. The differential diagnosis will include anaplastic ependymoma, atypical teratoid rhabdoid tumor (AT/RT), or other forms of highly proliferative malignant neuroectodermal tumors. Mass spectroscopy shows elevation of choline but little, if any, N-acetyl aspartate (NAA) peak. Elevation of the taurine peak may also be seen. Medulloblastomas are typically soft, fleshy, gray-tan tumors with variable hemorrhage and sometimes necrosis. Extensive stromal reticulin deposition may produce a firm consistency to the desmoplastic variant. Infiltration of the meninges and subarachnoid space may be apparent, as well as frank invasion of adjacent structures. All medulloblastomas are considered to be malignant and invasive tumors and are thus classified as grade IV by the WHO. 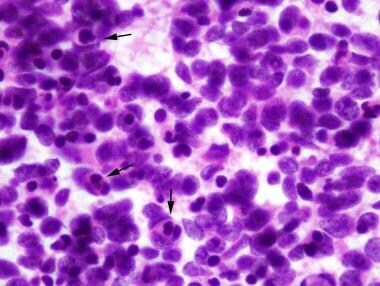 These are highly cellular neoplasms that are composed of cells with small- to medium-sized, hyperchromatic nuclei and little apparent cytoplasm, as seen in the image below. Classic medulloblastoma showing a diffuse pattern of tumor growth with poor cellular differentiation, nuclear molding, and minimal indistinct cytoplasm. Nuclear pleomorphism may be present to some extent, but it is usually not marked. Molding of adjacent cell nuclei may be marked due to high cell density. Nucleoli are not typically prominent, except in the large-cell/anaplastic variant. Mitoses are usually plentiful, as is the necrosis (apoptosis) of individual cells in the form of nuclear pyknosis, fragmentation, or karyorrhexis. Necrosis may be present, and although pseudopalisading necrosis and vascular endothelial proliferation are uncommon, they may occur. Homer Wright ("neuroblastic") rosettes may be found in about 40% of cases (see the following image), but such structures may be subtle or absent and are not required for the diagnosis. 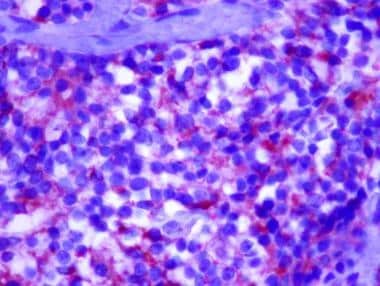 Nodular foci of tumor may present a less cellular, more "differentiated" character that rarely may include mature-appearing ganglion cells. Homer-Wright rosettes (arrow) are characteristically seen in medulloblastoma and other tumors with neuroblastic differentiation. 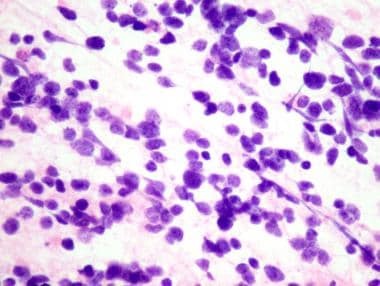 The term "small blue cell tumor" is somewhat of a misnomer, because the neoplastic nuclei of medulloblastomas are usually substantially larger than those of native cerebellar granule cell neurons. This point becomes relevant in the proper interpretation of intraoperative touch preparations or frozen-section material obtained from posterior fossa biopsies (see the image below). Intraoperative cytopreparation showing a medulloblastoma with poorly differentiated cells with little cytoplasm and nuclear streaming resulting from crush artifact. Native granule cells have small, round, hyperchromatic nuclei that are about the size of a mature lymphocyte nucleus (7 microns). Correlation of histology with imaging findings that provide the location and character of the lesion (solid vs cystic vs mural nodule) will greatly aid diagnostic interpretation. Although the majority of medulloblastomas have the classic histopathology described above, several variants have been defined and they have distinct clinical, as well as microscopic, characteristics. It should be noted that the usual type (classic) medulloblastomas may contain foci of increased anaplasia, suggesting progressive transformation, that should be documented in the pathology report. Minor foci of pale nodules may not be of clinical significance. However, the variants described below are those in which features of nodularity or a large-cell/anaplastic phenotype are the predominant histopathology. The desmoplastic/nodular medulloblastoma is a histologic variant that usually arises in a cerebellar hemisphere and is defined by the presence of a reticulin-rich stroma and reticulin-poor, nodular, pale islands with expression of markers of neuronal differentiation (see the images below). Nodular (desmoplastic) medulloblastoma with pale nodules of differentiating neuroblasts (neurocytes). Note the abundant intervening less differentiated internodular region. Extensively nodular medulloblastoma with minimal or no internodular component. Tumor within reticulin-rich areas is usually highly cellular and proliferatively active, whereas the reticulin-poor nodular foci show less mitotic activity and more neuronal differentiation. There is evidence that such tumors have distinctive molecular characteristics that are discussed below. An "extensively nodular" form of medulloblastoma may arise in very young children younger than 3 years. [1, 5] Such tumors have occasionally been noted to undergo neurocytic or gangliocytic maturation after chemotherapy and/or radiation. 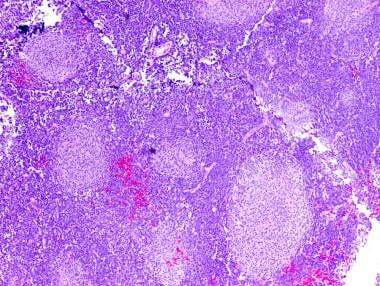 A variant of cerebellar medulloblastoma composed of large neoplastic cells with vesicular nuclei and prominent nucleoli as well as a superficial resemblance to a large-cell lymphoma was first described by Giangaspero and colleagues (see the following image). This large-cell variant accounts for approximately 2-4% of all medulloblastomas and can be demonstrated to exhibit neuronal differentiation by immunohistochemical detection of neuronal lineage antigens such as synaptophysin. It may be distinguished from the atypical teratoid/rhabdoid tumor (AT/RT) by its strong expression of INI-1 (BAF47); AT/RT is typically negative for this antigen. The large-cell medulloblastoma is a more aggressive variant and is less responsive to standard therapies. 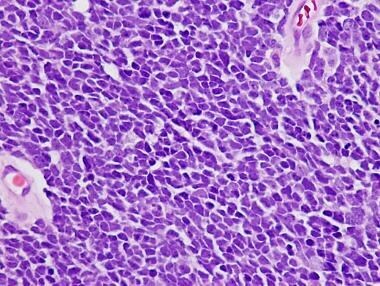 Large cell medulloblastoma with large vesicular nuclei, distinct nucleoli, and a vague resemblance to large cell lymphoma. 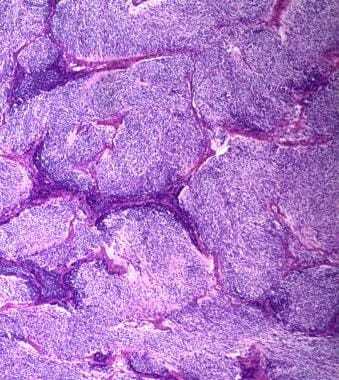 Note a "starry sky" appearance in this tumor. 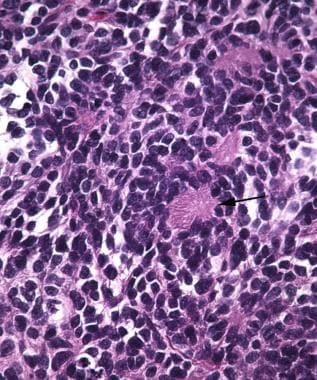 Anaplasia of medulloblastomas has been defined as increased nuclear size with more striking nuclear pleomorphism and molding than the classic type, high mitotic activity with atypical forms, frequent apoptotic bodies, and a distinctive wrapping of one tumor cell around another (see the images below). Up to 15% of medulloblastomas may be dominated by these features and are called anaplastic medulloblastomas. Tumors of this type also are biologically aggressive. Anaplastic medulloblastoma showing significant cytologic anaplasia, frequent cell wrapping (arrows), and apoptotic bodies in intraoperative cytopreparation. 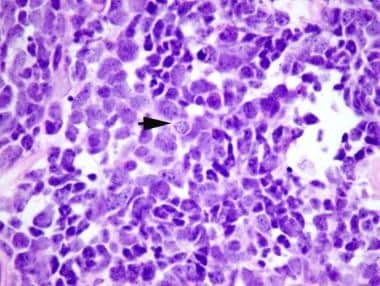 Anaplastic medulloblastoma showing significant cytologic anaplasia, frequent cell wrapping (arrow) and apoptotic bodies in histologic section. Variable degrees of anaplasia may be encountered in even classic medulloblastomas, and several studies suggest that a more refined grading system coupled with emerging information on molecular prognostic markers may allow for more precise patient stratification in the future. Histologic transformation of more typical types of medulloblastoma to an anaplastic type is well documented. Rare medulloblastomas may show evidence of skeletal muscle (medullomyoblastoma) or melanocytic differentiation. 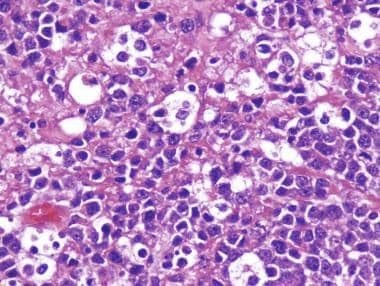 Data on the natural history of these tumors suggest a similar biologic behavior as more typical medulloblastoma types. The CNS origins of this primitive neuroectodermal tumor can be confirmed by immunohistochemical studies. Synaptophysin, neuron-specific enolase, MAP-2, and class-III beta tubulin will be at least focally immunoreactive in most medulloblastomas (see the image below). Immunopositivity for synaptophysin in a medulloblastoma. Reticulin-free nodules of the desmoplastic variant are typically reactive for markers of neuronal lineage. Vimentin is typically reactive although quite nonspecific. Variable expression for neurofilament proteins has been documented, and immunoreactivity is dependent on the neurofilament subtype and the antibody used. Glial fibrillary acidic protein (GFAP) is most often reactive in cells with fibrillary processes that appear to represent reactive (intratumoral) astrocytes. Occasional examples of medulloblastoma (estimated at around 10% of these tumors) will show distinct GFAP-immunoreactivity of the perinuclear cytoplasm. Rare examples of medulloblastoma may contain spindle cells or occasionally "strap" cells with cross-striations consistent with myogenic differentiation and, accordingly, show strong reactivity for desmin (and other myogenic markers). The most common cytogenetic change found in medulloblastomas (over 40%) is loss of chromosome 17p, which is frequently accompanied by duplication of the long arm, resulting in an isochromosome 17q. One of the candidate tumor suppressor genes on 17p is KCTD11 that inhibits a sonic hedgehog (SHH) signaling pathway known to regulate cerebellar granule cell proliferation during development. During normal brain development, SHH protein secreted from Purkinje cells inhibits a cell-surface receptor (encoded by the PTCH gene on chromosome 9), thus promoting proliferation of cerebellar external granule layer (EGL) cells. The EGL cells give rise to internal granule cells, which are the most abundant neurons of the brain. Patients with the nevoid basal cell carcinoma syndrome (NBCCS) (Gorlin syndrome) have germline mutations of PTCH, a tumor suppressor gene. When active, PTCH inhibits Smoothened (SMO), a cell surface protein that regulates a cell proliferation pathway that includes several intracellular downstream effectors such as GLI1 and MYCN. Inactivating PTCH mutations in patients with NBCCS presumably release susceptible cells from PTCH -mediated inhibition of cell proliferation, with resulting neoplasia. PTCH mutations (allelic losses) have been identified in about 10-18% of medulloblastomas, especially the desmoplastic type, but such mutations are much less common in the most common classic variant. Copy gain and aberrant expression of FOXG1, a downstream effector of SHH signaling with a putative role for maintaining a persistent undifferentiated state in neuroepithelial stem cells, has also been reported to be a frequent event in medulloblastoma. Some patients with germline mutations of the adenomatous polyposis (APC) gene may develop medulloblastoma in addition to their predisposition to colon cancer (familial adenomatous polyposis [FAP]). The APC protein is an inhibitor of the WNT pathway. Turcot syndrome describes the subset of patients with FAP that develop medulloblastoma. Based on combined data emerging from gene expression profiling, CGH array, and cytogenetic studies and their correlation with clinical outcome, medulloblastomas have been divided into 4 clinical subgroups, depending on the predominantly activated signaling pathways in a tumor. These include 2 groups with predominant wnt (group A) or Sonic hedgehog (SHH) (group B) pathway activation, respectively, and have a better prognosis. The other two groups, C and D, are biologically aggressive and noted to overexpress either MYCN (group C) and/or OTX2 and FOXG1 (groups C and D). In addition, some specific genetic events serve as signatures for each of the subgroups. The group A tumors are more likely to show a loss of chromosome 8, CTNNB1 mutations, rarely metastatic, show classic histology, occur in older children, and have a good prognosis. Group B tumors are more likely to show a 9q deletion, PTCH/SMO/SUFU mutations, MYC amplification, and a desmoplastic histology. They are seen in infants and adults, rarely metastatic and have a good prognosis. Intraaxial tumor spread along CSF pathways is characteristic of medulloblastoma and is identified in about 30% of patients at presentation. Subpial and parenchymal infiltration of tumor cells is not uncommon. Distant metastases are exceptional. Occasionally, tumors have metastasized outside of the nervous system via ventriculoperitoneal shunts or other iatrogenic means. No evidence of metastatic spread of disease within the neuraxis. High-risk patients will have significant residual disease after surgery (>1.5 cm maximum diameter) and or evidence of spinal or other metastasis (usually within the neuraxis). Patients younger than 3 years are also considered high risk, with the exception of those very young patients with the extensively nodular histologic variant, in which a better prognosis has been observed. Patients who do survive often experience significant neurologic impairment due to unavoidable side effects of radiotherapy, and current research is focused on identifying biomarkers of disease that will allow for better risk assessment and more refined treatments that are directed to individual tumor types. Treatment for medulloblastoma typically includes surgery (with gross total excision, if possible), craniospinal radiation therapy, and adjuvant chemotherapy. The overall 5-year survival rate is currently around 60%. The expression of nuclear beta-catenin occurs in 15-20% of medulloblastomas and is considered to correlate with activation of the WNT signaling pathway and a better patient prognosis. In contrast, the MYCC gene is amplified in around 10% of medulloblastomas and is most often observed in anaplastic variants of medulloblastoma (see the image below). Studies suggest that MYCC alterations may be involved in the progression of medulloblastoma to anaplastic variants. Other molecular alterations associated with a poor prognosis include chromosome 1q gain, MYCN amplification (see the following image), C-ERBB2 overexpression, and p53 mutation/expression, whereas loss of chromosome 6 and TRK-C expression are related to a better prognosis. Ongoing and future studies of medulloblastoma biology may provide a better understanding of tumorigenesis that will lead to more accurate stratification of patients for therapy and novel therapeutic targets. MYCC amplification is a poor prognostic marker in medulloblastoma, and it is often associated with the anaplastic/large cell phenotype. 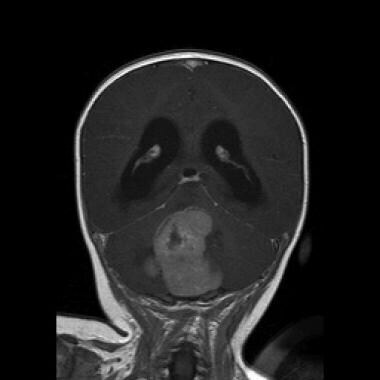 The most important differential diagnosis in children is an ependymoma arising in the fourth ventricle, which can present a similar gross appearance to medulloblastoma. Although cerebellar pilocytic astrocytomas tend to present as a cystic structure with an enhancing mural nodule, an occasional solid tumor of this type may mimic the imaging appearance of a medulloblastoma. The large-cell/anaplastic variants may be distinguished from AT/RT by imumnostaining for INI1 which is positive in medulloblastoma but negative in AT/RT. Giangaspero F, Eberhart CG, Haapasalo H, Pietsch T, Wiestler OD, Ellison DW. Medulloblastoma. Louis DN, Ohgaki H, Wiestler OD, Cavenee WK, eds. WHO Classification of Tumours of the Central Nervous System. Lyon, France: International Agency for Research on Cancer (IARC); 2007. 132-40. Crawford JR, MacDonald TJ, Packer RJ. Medulloblastoma in childhood: new biological advances. Lancet Neurol. 2007 Dec. 6(12):1073-85. [Medline]. Polkinghorn WR, Tarbell NJ. Medulloblastoma: tumorigenesis, current clinical paradigm, and efforts to improve risk stratification. Nat Clin Pract Oncol. 2007 May. 4(5):295-304. [Medline]. Gilbertson RJ, Ellison DW. The origins of medulloblastoma subtypes. Annu Rev Pathol. 2008. 3:341-65. [Medline]. Yachnis AT, Perry A. Embryonal (primitive) neoplasms of the central nervous system. Perry A, Brat DJ, eds. Practical Surgical Neuropathology: A Diagnostic Approach. New York, NY: Churchill Livingstone; 2010. 163-76. Dellovade T, Romer JT, Curran T, Rubin LL. The hedgehog pathway and neurological disorders. Annu Rev Neurosci. 2006. 29:539-63. [Medline]. Fan X, Eberhart CG. Medulloblastoma stem cells. J Clin Oncol. 2008 Jun 10. 26(17):2821-7. [Medline]. Pfister SM, Korshunov A, Kool M, Hassellblatt M, Eberhadt C, Taylor M. Molecular diagnostics of embryonal tumors. Acta Neuropathol. 2010. 120:553-566. Shih DJ, Northcott PA, Remke M, Korshunov A, Ramaswamy V, Kool M, et al. Cytogenetic prognostication within medulloblastoma subgroups. J Clin Oncol. 2014 Mar 20. 32(9):886-96. [Medline]. [Full Text].